An exoplanet has been discovered by astronomers that reflects less than one percent of the light it receives from its parent star. Less reflective than black acrylic paint, this planet is literally darker than coal! TrES-2b is a Jupiter-sized gas giant orbiting the star GSC 03549-02811, about 750 light-years away in the direction of the constellation Draco. 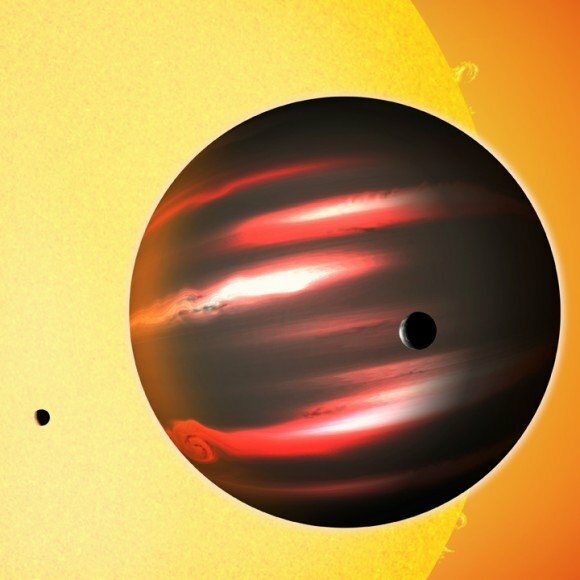 First discovered in 2006 by the Trans-Atlantic Exoplanet Survey (TrES), its unusual darkness has been identified by researchers led by David Kipping from the Harvard-Smithsonian Center for Astrophysics (CfA) and David Spiegel from Princeton University, using data from NASA’s Kepler spacecraft. 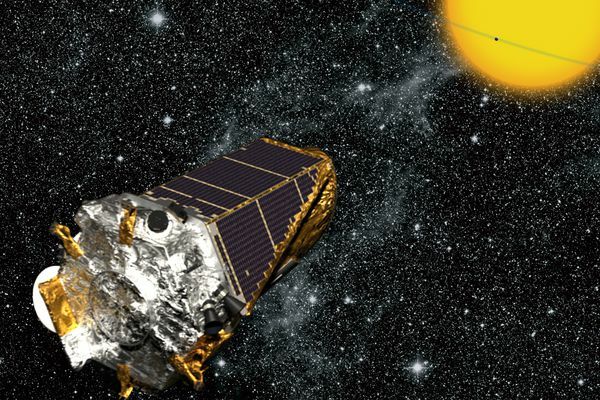 The team monitored the brightness of the TrES-2 system as the planet orbited its star and detected a subtle dimming and brightening due to the planet’s changing phase. A more reflective planet would have shown larger brightness variations as its phase changed. The dark exoplanet is tidally locked with its star and orbits it at a distance of only 5 million kilometers (3.1 million miles), keeping it heated to a scorching 1000º C (1,832º F). Too hot for the kinds of reflective ammonia clouds seen on Jupiter, TrES-2b is wrapped in an atmosphere containing light-absorbing chemicals like vaporized sodium and potassium, or gaseous titanium oxide. Still, this does not completely explain its extremely dark appearance. Regardless of its faint glow TrES-2b is still much darker than any planet or moon in our solar system. The new work appears in a paper in the journal Monthly Notices of the Royal Astronomical Society. Read the new release here. Jason Major is a graphic designer, photo enthusiast and space blogger. Visit his website Lights in the Dark and follow him on Twitter @JPMajor and on Facebook for more astronomy news and images!